And these are the people who want to “spread democracy” around the world. 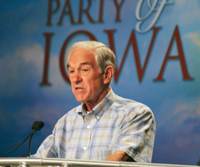 Has Ron Paul broken any rules? Has he cheated? No one even pretends he has. Yet his victory, which the Establishment now seems to expect, is still suspect. How dare he not want to stampede the country into another war promoted by the same propagandists who gave us the Iraq fiasco! How dare he dissent from the (Republican and Democratic) Establishment, which has wrecked the economy, saddled us with unpayable debt, and given us a fiasco of a foreign policy that has made Americans more hated and isolated than ever before! Note what they don’t say. They don’t say a Romney win would hurt the caucuses, even though Romney said “my views are progressive” just five years before running for president the first time. I won’t bother listing all of Romney’s offenses. As for Ron Paul being to the “left” of Obama on foreign policy, this is a total misconception. See the foreign-policy resources on this page (below the section on war powers) for an elaboration. So here’s the message: the candidate the elites least want you to vote for is Ron Paul. The newspapers, the cable news people, the politicos. They are dying for you to support Romney, Gingrich, Perry, Bachmann — anyone but Paul. That is another great reason to support him.